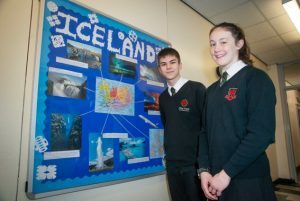 Holy Cross students will be studying geysers and glaciers on a STEM school trip to Iceland – and this year they are hoping for snow! Head of Science Mr Power ran the educational trip for the first time last year but the group didn’t see the Northern Lights or snow. “We are going in January this year, during the holidays, to hopefully guarantee snow although we will just have to hope we see the Northern Lights,” said Mr Power. He is taking students from Year Seven to ten on what promises to be a trip-of-a-lifetime for many of them. “They all study science and it will be an amazing experience for them. “They can learn about earth, science and space all in one area. “We will go to three lots of waterfalls, go on the site of a volcano and stand on the bridge between the two continents.